Description: Longman, Harlow, Essex, 1988. First Paperback Edition, Paperback, Illustrated by: Photo's & Drawings. Near Fine/N/A. 9780582492721 black titles spine; N.B. 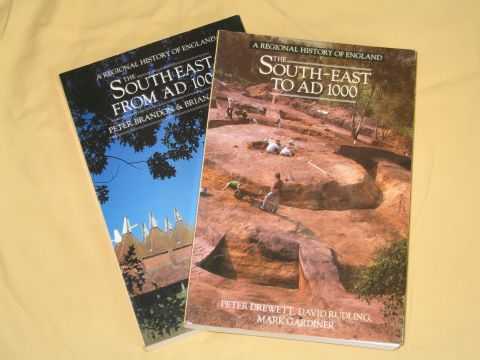 - this book is for sale only with it's companion volume -"South-East from AD 1000" (the books are priced individually); one of the 'A Regional History of England' series; front cover illust. shows excavation of Bronze Age barrow at West Heath, West Sussex; illustrated throughout with maps, diagrams and half-tones; "This is the first full account of the South East (the modern counties of Kent, Surrey and Sussex) from the first appearance of Man in Britain to the Early Middle Ages. Through a synthesis of the findings of archaeological research the authors present the development of human culture in the region from before 300,000 BC. Their particular emphasis on economic archaeology enables them to uncover the region's trade and redistribution networks. These reveal the insular nature of much of the South East's development, despite its contacts with other parts of Britain and Europe. The authors discuss the producers of wealth - farmers, craftsmen, peasants, serfs and slaves - rather than those who simply manipulated it. They find continuity in the development of farming practice but a concomitant discontinuity in ceremonial and social organisation. Intensive development, road construction, and especially ploughing have destroyed many archaeological sites in South East England. Fortunately key sites have been saved by archaeologists working under rescue conditions. This book is written by three archaeologists who have attempted to follow research themes through their rescue archaeology. This, combined with the increasing refinement of archaeological recovery techniques, has resulted in a book which contains a wealth of new data and ideas. It will be widely welcomed by readers both in and out of the South East, and mark a further important addition to this distinguished series. "; including index & bibliography - 384 pages. N.B. together these two books, with protective wrapping, weigh well above the 1kg. standard quoted rate for post & packing so extra shipping charges will be requested. Size: 8vo - over 7¾" - 9¾" tall. Illustrator: Photo's & Drawings. Quantity Available: 1. Category: Archaeology; South-East England; Kent, Surrey and Sussex; economic archaeology; England; Ancient (BC); History. ISBN: 0582492726. ISBN/EAN: 9780582492721. Pictures of this item not already displayed here available upon request. Inventory No: HST00059.